Reminder: IGDA Vancouver soft-launch and Global Game Jam Post-Mortem takes place tonight. More info on the event’s Facebook page . Reminder: Ontario companies, get your submissions in for the INplay Ontario Show & Tell Kids Interactive Showcase , the deadline is April 1st. Also note that the INplay  Kick Off registration rate for attendees will end tomorrow. Reminder: There is one week left to get your nominations in for the Canadian Video Game Awards . 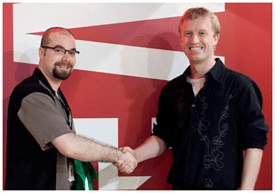 I nominated at least a dozen, is your favourite Canadian-made-in-2010 game nominated? No? Make it so – nominate it today. Congratulations to VFS Game Design  graduate Zach Williams, who has been named as the very first recipient of the Brian Wood Memorial Internship , an internship that will be awarded three times annually to celebrate the life of Relic employee Brian Wood, who was killed in a tragic car accident last year. Zach, who has previously worked in the local industry as a QA Tester, will begin a four-month internship at Relic Entertainment . Unless you have absolutely no interest gaming, you will be well aware that today is the launch of the demo for Dragon Age 2 , available on PC, Xbox 360 and PlayStation 3. Bioware  will, as we told you last week, unlock two perks should the demo be d ownloaded and played by 1 million gamers before March 1st. The key to answering this Call To Arms, as the demo phase has been dubbed, is that you must sign in to your EA  account. So in our house, at least, that has been achieved by two of us on two separate Xboxes. I’ve played a few minutes of the demo, and thus far Dragon Age 2 looks awesome – the only part I’m concerned about is that the text is awfully small and sometimes difficult to read on a CRT television, even with a large screen. Speaking of User Based Billing, Open Media  is still fighting the good fight, and have issued their own call to arms  as Rogers and the other obese telecoms meet to find ways to defeat the right of Canadian consumers to have access to fair and affordable internet services. In a post on their site, Open Media asks for the support of consumers in continuing the fight for our rights, and yes, this fight will require funding . We don’t have a huge amount of disposable income in our house, but honestly I would rather help Open Media with a $20.00 donation than pay it to any telecom for an already overpriced cable plan. If Open Media can raise $15 000.00 in the next 48 hours, indie ISP providers TekSavvy  and Acanac  will match those funds. Please help if you can. I would like to add to this plan of action by asking all of you to write your MP and Industry Canada – don’t just accept the bullying of the telecoms as a done deal. We can fight back – we’ve already shown that with the delay of User Based Billing – and we can make a difference. I found an old flyer the other day when I was making an attempt at cleaning up the clutter in my office. This flyer was from our local MP, Mark Warawa (Conservative) and the headline phrase on this flyer is that the Conservatives stand up for Canadian consumers. Well? Let’s see some action behind that statement. Not sure how to contact your MP? Check here . And don’t forget – the CIRA-hosted Canadian Internet Forum  being held in Ottawa on February 25th will be available via webcast (yup, burning up more of those gigabytes), so remember to tune in and watch the discussion about the future of Canada’s internet and digital economy. There is also an active discussion group on the CIF site, registration is required to view and post on it. Both the Standard Digital Edition  and the Deluxe Digital Edition  can be pre-ordered at the Ubiworkshop Store. Microsoft  has announced that it will release a non-commercial Kinect for Windows software development kit from Microsoft Research  later this spring, followed by a full commercial version of the SDK later in the year. This “starter kit” for application developers is intended to make it easier for academic research and enthusiast communities to create even richer experiences using Kinect technology. Through its collaboration with the Interactive Entertainment Business (IEB), Microsoft Research is hoping to support a growing community of academic researchers and enthusiasts who are exploring potential applications built using Kinect.